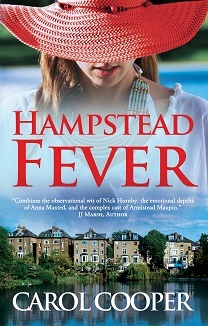 I love Hampstead, so it’s no surprise that I decided to set my novel Hampstead Fever there. These are just a few images to give you a taste of Hampstead life if you’re not already familiar with it. Hampstead Underground Station, first opened in 1907, has the deepest lift shaft of all the London stations. Here’s the view up Heath Street, towards the, er, heath (photos of Kenwood and Hampstead Heath will have to wait). These friends are just enjoying breakfast on a Sunday morning. Though some tables outside can be quite exclusive. Some street furniture (this Victorian postbox is no longer in use). Constable and his family once lived here too. He’s buried in St John’s churchyard, NW3. It’s not all blue plaques around here. Flower seller Maggie Richardson has this memorial to her name. Hampstead is nothing if not trendy. Queues often build up outside the Hampstead Butcher & Providore. This is the flower shop in iconic Flask Walk. There’s a new restaurant in Church Row, where Le Cellier du Midi used to be. The Freud Museum – where both Sigmund and his daughter Anna once worked – is down a leafy street. Much of this scene will change with the new cycle superhighway. If CS11 is implemented, as looks likely, cars and lorries will be diverted away from the main arterial road and into Hampstead village, choking side-streets and polluting the area. Locals are as concerned about safety for cyclists as anyone else, but believe a better solution could be found. Newsflash for TS Eliot: it’s not just the naming of cats that’s a difficult matter. Books are equally tricky. If you’re traditionally published, you may not need to give it much thought. One of my books was born with the zingy title of Twins and Multiple Births with barely any input from me. I can’t really complain. It may be low on pizzazz but it’s a fair description of the contents. But now that I am nearing the end of my second novel, and the cover design is imminent, I’ve come to the conclusion that Camden Passage isn’t after all right for a racy story about dating in London. Camden Passage is in Islington, not in Camden. It’s a stylish destination for shopping and eating out, but still, could the address confuse non-Londoners? For American readers, the potential for confusion is far greater. Camden, New Jersey, is often cited as one of the poorest and most violent cities in the USA. It was no doubt an ideal venue for President Obama to announce his new police initiative last year, but it’s about as far from a classy location as you can get. Now I’ve abandoned Camden Passage, I’m left with various techniques for finding a new title for my novel. 1 Book title generators like Fantasy Name Generators, Adazing’s book title generator, and a fun blog post by Tara Sparling. 2 Asking friends and family. 3 Talking to other authors. 4 Polling readers of existing books. There’s the title bracket system described by Nathan Roten in his blog post for ALLi. 5 Going to a quiet bar and staying till the barman comes up with a suggestion. 6 Aiming a dart at the dictionary. I’ve already tried some of these methods. With a dry January, number 5 won’t fly, and I didn’t quite gel with If Clouds Could Steal, suggested by one of the title generators, but polling writer friends and readers remains an idea. As a journalist, I think bending well-known titles appeals to me more, and that might inject just the right note to hint at the wit within the pages. The reading world already has Aberystwyth Mon Amour and A Year in Cricklewood. On that basis, Much Ado about Something Quite Serious makes perfect sense to me. I can also foresee shelf space for gems like The Ice Triplets, Bonfire of the VAT Receipts, Breakfast at Lidl’s and Great Expectorations (set in a TB hospital in the 1950s). Hampstead is the scene for much of the action in my novel. Might Hampstead for Dummies work? Hmm. Not convinced. But I rather like Hampstead Handyman which conveys a certain amount of action. Unfortunately it’s unlikely to fulfil its promise unless, as a friend suggested, I actually write a handyman into the story. Those who can’t decide on a single name for their baby sometimes string all their favourites together as middle names for their little darling. You know the type: the newborn son or daughter saddled with the names of the entire football squad. That may explain how Tom Wolfe got the Kandy-Kolored Tangerine Flake Streamline Baby. Though strictly speaking this was a car, not a baby. So here I am at the start of the year and the end of my novel, my head spinning with title possibilities, all of them still wide of the mark. If you’re an author, how do you choose your book titles? I’d love to hear from you.